From "Zuñi Breadstuff," Millstone 9, no. 6 (1884): 93-95. WHEN the kernels have sprouted all through the field described in the last chapter, we find the planter busy inspecting the hills near the prayer-stick. Upon this inspection hangs the fate--so he thinks--of his cornfield; for if every kernel in each of the six sacred hills has "come out," the crop will be productive. If, on the contrary, one or two of the grains in, for example, the southern hill have not sprouted forth, "Alas!" part of his crop of red corn will be a failure; will not get ripe before frost time. Toward noon he is joined by two or three of the women and some of the children of the household, and perhaps by as many neighbors. Wherever a sprout looks yellow, they dig down and kill the little white worm they are sure to find near the root. This is called "grub-finishing." Wherever the plants are very vigorous, they pull up all except four or five of the best, and this is called "leafing" or "leaf-lifting." The occasion which follows soon and is recurrent twice or thrice during the warm season is perhaps the jolliest of the summer. It is the "hoeing" or "staving time" as the Zuñis call it in well remembrance of the instruments with which their ancestors hoed, away back in the age of stone. These were crooked, sharp-edged staves of hard wood, shaped not unlike sickles, or better still, short scythes. (See fig. 4.6.) Rude as they were, they seem to have been wonderfully efficacious in the removal of weeds, for the operator, progressing on his knees, swept the scythe-hoe from side to side between the rows of corn, cutting off wide swathes of weeds, just below the surface of the soft yielding soil. The principal drawback to this implement was that it proved equally efficacious in wearying the man who wielded it. Therefore, while with the introduction of iron the heavy hand-wrought hoes affected to-day by the Zuñis displaced the ancient wooden instrument, not so with the name the latter gave to hoeing. Every night at staving time you will hear women calling in at the doorways as they go the rounds of their husbands' clans, "She! Tomorrow we stave," for only the poorest Zuñis hoe their fields unaided. Next morning a goodly number of the men thus summoned gather at whatever house was represented by the woman who summoned them. Without breakfast they betake themselves to the field and-hoe with might and main until about eleven o'clock, then stop to eat luncheon and joke with the girls who brought it down, and who are, true to nature, dressed in regular holiday costume. They have been "grinding" all the morning, in time to the shrill chant of the mistress, or of some old aunt whose back is too stiff for the mealing trough (or who pretends it is) but whose voice is, if possible, shriller than ever. If you look at these giggling, droop-eyed girls, you will see that they are a degree whiter than they were yesterday. They've actually been powdering! just before starting out with the lunch eon each one, warmed and perspiring from the violent exercise at the metate; grabbed up a handful of white meal, rubbed it well between her palms, and applied it evenly all over her face and neck. When the girls have returned to help cook for the "stavers," the latter resume the work, but now more moderately. Laughing, joking, telling stories of the olden time (not folklore, that is forbidden, for the rattlesnake is abroad! ), racing at their task, playing pranks, they are the lightest-hearted laborers you ever saw. According to these stories, it was not like this in the olden time of which they tell. Many of the laborers of primitive pueblodom were given their tasks which they had to finish under a priest's inspection. Later on (and even that was a long time ago) war originated these hoeing bees (or "staving councils"). They were not then as now light-hearted crowds. Each member of them was like a deer on an open plain, fearful lest every puff of wind should bring sounds or sight of some enemy. Full often the enemy did come. Daring not to attack the terraced town, he hung about the distant fields, seeking vengeance for those of his tribe who had fallen under the knotty clubs of Zuñi. And woe to the workers if they proved but few! Armed even as they worked, brave with desperation, it was rare they ever saw Zuñi again; for the cowardly Navajos rarely came but in swarms. Some of the most thrilling traditions of Zuñi tongue concern these and the harvest days of long ago; and it is with regret that I pass my notes of many a long recital by for the short and perhaps less interesting tale below. Below the pueblo of Zuñi westward, in one of the long arms of the valley, there stands, perched upon the summit of a high rock, an ancient tower of stone. You reach the doorway of this solitary little citadel by means of an old log notched at intervals to form rude steps. Entering, you find a neat little room, well plastered, in one corner a tiny fire-place, and opposite a single mealing-slab, while above hangs a blanket-pole. The cinders yet lie on the hearth-stone, the pole glistens still brightly from its shadowy recess, the meal clings even now to the roughened face of the mill-stone. It seems as though only yesterday the fire was kindled, as though its light still lingered along the polished pole, as though the women had but just ceased to ply the molina in the mealing trough and had gone out to watch the wide cornfields or bring water. But it is fifty years since the flames died away on that hearthstone; fifty years a little streak of sunlight has played along the blanket-pole, replacing the fire's ruddy glow; and for fifty years the story has been related at each hoeing, how the woman went out one morning--never to return. And the half of this tale is already told if you but climb another notched log leading through the trap-door by the chimney into an upper room. There are double port-holes here, which from without seem like the sightless sockets of a crumbling skull. By the light they let in you see that the plaster is broken and stained here and there with dark patches. Splintered shafts and shivered stones lie strewn about--ungathered by those who anxiously searched there fifty summers ago at sunset. For the little house on the rock once belonged to Um'-thla-na--"He of large muscles." He was living there with his family to tend the cornfields. The women went out early one morning to get water. No sooner had they neared the distant pool than they heard the tread of many horse-hoofs. Then they saw, sweeping down the valley, a crowd of mounted warriors. They dropped their water-jars and fled, one to the neighboring rocks, hours after to appear breathless and fainting at Zuñi; but the younger toward the little tower, the steps of which she never ascended, for, caught up by some wrangling horsemen, wrangling for her possession, she was borne away into years of captivity. Um'-thla-na heard the rush of the riders, grasped up his war-club, bow and arrows, and not pausing to close the doorway, clambered the step-log in the corner and barricaded the trapdoor. Soon the Navajos thronged into the lower room. They snatched the serapes from the blanket-pole, they stole the basket of corn cakes and paper bread. Wild with glee over these delicacies so rare to their roving life, they never noticed the trapdoor, but ran out and sat down about the doorway to feast. Alas, Um'-thla-na! why did he not keep quiet? Peering out through a port-hole, he saw a big Navajo calmly sitting near the step-log eating a roll of paper bread. He drew an arrow to the head, let fly, and struck so fairly the feasting raider that he uttered never a groan but fell over against the ladder still grasping his roll of guyave. Another, sitting near, saw him fall, but ere he could call an alarm he too was pinned with one of Um'-thla-na's arrows. As this one fell, Um'-thla-na raised a yell of victory, "changing his key that the Navajos might think him many." At first the enemy fell back, but when they found there was only one man, they rushed toward the house again. For awhile Um'-thla-na's arrows fell so thickly that the hazard of near approach kept the Navajos from charging. Even when his shafts were spent he pulled stones from the wall and broke them against one another, casting them down at the enemy. The port-holes were small and he had to stand quite close to them. Soon an arrow whizzed through one, sticking him in the arm. Um'-thla-na clinched his teeth and plucked it out, shooting it back. Ere long he was wounded in many places and weak from loss of blood; still he stood bravely at bay by the port-holes. One of the Navajos more distant than the rest, saw Um'-thla-na's face at the hole. Taking careful aim he let go so cleverly that Um'-thla-na, dodging, was shot through the neck. He staggered back, falling heavily, then roused himself and sat up against the wall, clutching his war-club. Now the Navajos rushed toward the doorway. Suddenly they fled away, for, behold! coming swiftly across the valley in a cloud of dust was a band of Zuñi horsemen. The Zuñis pursued the flying Navajos, never thinking of Um'-thla-na. At last the poor old man, hearing no sound, pulled some of the arrows from his wounds, broke others off, and slowly, painfully clambered down the step-log, and staggered out into the plain toward Zuñi. Fainter and fainter he grew, until he swooned by the trailside. Toward sunset they found him there, those who came to seek. Some staid to tenderly care for him, while others went to search for the young woman. They did not find her, but lying dead on the rocks near the tower were five Navajos. One of them was leaning against the step-log still grasping in his hand a roll of paper bread. Um'-thla-na lived to tell the story, but grew worse as the arrow wounds rancored, and "killed himself that he might be divided from pain." Nobody lives in the little house now. "It is a place of painful thoughts," say the narrators; but it stands always the same, for its builder was "He of large muscles." At sunset the men file in from the field. The women have spread or rather strung the feast out on the lowest roof. Ten or twelve great bowls in a row, smoking hot with stew, every one as red with chili as its rising vapors are with the touches of sunset. There is a row of breadstuff, thin as paper, flaky as crackers, red, yellow, blue and white, piled up in baskets down either side of the meat bowls. Outside these, two other rows, this time of blankets and stool blocks. The first man whose head appears up the ladder is besieged with polite invitations to "Sit and eat, sit and eat," from as many pairs of lips as there are women on the house-top. Men all are seated, a sacrifice is made to the household fire; up to this time the talking has been rife; now it ceases altogether. Everything except eating seems tabu until the feast has disappeared, and the cigarettes are rolled and lighted. Then talking resumes and long into the night continues. to a wooden handle (see fig. 4.7) or a hoe of hard wood similarly fastened to the handle and surmounted by a heavy stone (fig. 4.8) were used for this purpose. Autumn comes and the "corn children" have been taken in to meet their "Father and Mother," the yä'-po-to and the mi'-k?iap-pan-ne. A while later, another search is made through the field, this time for such corn as gives no promise of ripening. Blanketful after blanketful is picked, husks and all, and carried to some distant wooded hill where the soil is solid. Here, with sharp sticks, and hoes, a hole is dug resembling a well (see fig. 5). At the top, it is cut larger around, to the depth of a foot or more and walled up neatly and solidly with sandstone. Below this wall, say a foot, the hole is gradually enlarged toward the bottom, until it embraces a room several feet in diameter and cone-shaped, the apex as it were, being the walled, circular opening. From the windward side of the hill, a trench is dug to a level with the bottom of the excavation. A hole or passage, about two feet in diameter is cut from the end of the trench to the interior. Dry grass, old leaves, pitchy sticks, are thrown in from above, and arranged by a man who has entered through the trench. On top of these wood is piled until the hole is full. The mass is now fired. As soon as the night-wind rises, flames dart upward through the circular hole, many feet into the air, straight, lurid, setting the woodlands around and the skies above, fairly aglow with ruddy splendor. All night long, a merry group of young people dance, sing and romp around this volcano-like oven. Wood, whenever needful, is piled in until late next morning. At last the embers have burned low, and smoke has ceased to rise from their glaring red depths. Corn-stalks, green and plentiful are thrown in, more are tucked into the large draught-hole, and preparations are made for artificially ripening that which nature has procrastinated over. A beautiful, long, fresh stalk is chosen, leaves, tassels and roots complete. Two fine ears of corn are stripped of their husks. One of them is laid against the stalk, the other cleansed of its silk as though for boiling. The chief of ceremonials bites off from this all the milky kernels mouthful by mouthful, chews them to pulp, and blows their substance into fine mist over the heaps of plucked corn. He then places the cob by the side of the other ear, and binds both firmly to the stalk. This, in the brief prayer he presently makes, is called the shi'-wa-ni or priest. It is cast into the still glowing pit, and then, men, women, young and old, begin to hurl in the unhusked corn from all sides until no more is left. Most likely space remains at the top. If so, it is quickly filled with green stalks, more of which are bundled up and used as a cork for the circular opening. A mound of damp soil is heaped to a considerable height above this impromptu stopper. As night again comes on, campfires, bright enough it is true, but pale compared with the flames of last night, are built at convenient distances. Muffled sounds come all night from the buried oven. Sometimes, though rarely, the top is blown off, but usually next morning the mound is found unchanged and the sounds have ceased. Now comes a sight which would surprise a stranger, miles away though he might be. The earthen mound is removed and the stopper of corn-stalks, with great trepidation, most gingerly pulled out. Instantly, hissing and seething, the steam from the heated corn and stalks below, shoots hundreds of feet into the air. On a clear day in green-corn time dozens of these white columns may be seen rising from the wooded slopes around the vale of Zuñi. It is not until toward afternoon that the mass is sufficiently cooled to admit of approach. As soon as possible the corn is handed out through the draught hole (which has been enlarged for the purpose) sewed up in blankets, strapped across burros and transported to the town. Every member of the party, as it approaches Zuñi, may be seen gorging this--really delicious--baked corn. When it is unloaded into the spare room, the heat has not yet left it. With all possible haste, the husks are stripped down, and the ears, now brown and plump, are braided into long bunches, and the whole is hung up to dry in an upper room. Many of the leaves in the field still remain green. These are gathered, carefully dried and folded into large long bundles, for winter kitchen use. Quantities of late squash and pumpkin flowers are stored away in jars to serve a similar end. As the corn ripens, you may see fires burning at almost any of the quaint little farm huts (see fig. 6), for children or very old men watch there day and night, to keep crows, coyotes, and burros away. The crows are worse than they were last spring. The coyotes are not outdone by the crows at either time, but the burros are worse than both together. They are, to quote Zuñi, Mi'-wi-hâ or "adopted of corn." You may put them in the corrals, tie their fore-feet close together, or herd them as you will, but some of them will "leave tracks and love corn in every field." The remedies are many and ingenious, but all more or less fatally short of happy results. Each man in Zuñi knows every other man, and equally as well, he knows every other man's burros. If a burro is found in a cornfield some morning, the field owner counts the exact number of missing or injured ears, and drives the burro home. Forthwith he seeks out the animal's owner. If the latter prove obdurate, the sufferer informs the chief and bides his time. Woe to that burro if he get into the cornfield again. He may consider himself fortunate if he lose but one or even both ears. Sometimes he is gagged with a big stick, a cord being passed from either end of the stick up over the shoulders and back, and under the tail. The burro is then welcome to remain in the cornfield as long as he chooses. At other times, the luckless animal is thrown and a few of his teeth pulled Zuñi fashion; which is to say, a thread of sinew is looped to each, a heavy stone is tied to the sinew, and hurled into the air. I remember a lawsuit of three nights' duration over one of these animals. Ever after, he was called the "short-horn," and little wonder! For his ears had been shaved close to his head, his tail cut off short, the tip of his tongue and part of his teeth amputated, his left eye put out, and his back so stiffened by castigation that a five-foot straight-edge laid lengthwise along the very acute angle of his vertebra, would have touched at every point. Two years I knew that burro personally. His working days were over. He used to get deplorably hungry, and I sometimes fed him; for, winter or summer, he dared not stir from the protecting although inhospitable shadows of the walls of Zuñi. He preferred picking cedar bark from the fire-wood, anything he preferred, to going abroad. In fact, had he been able to run he would certainly have done so at the sight of a field of corn. In pity both for crows and burros, I have sometimes pleaded mitigation of the customary severe measures. My experiences at such times lead me to advise all aspiring ethnologists to mind their own business when corn is in the question. As I have said before, the Zuñis, and probably most other Indians, are touchy on the subject of their breadstuff. Frost comes, changing the green of the stalks to yellow gold, the leaf-like shucks to feathers. In every field are corn pickers and huskers. Such corn as is not husked in the field, is packed with consummate method on burros or in carts and a few second-hand wagons, and brought to the town. Husking bees are formed by the women, and at three o'clock any afternoon you can see around a corner, mountains of cast-away shucks, and many a black, frouzzly head sticking up from their flaky slopes, bobbing bodilessly with the severance of every ear from its rattling wrappings. At such times husks in great numbers are selected, bundled into neat bunches and strung several feet long on threads of yucca fiber. They will be needed before the month is gone, particularly in the council chambers, where every night brings the weary law-givers of Zuñi fresh cases of trespass for consideration. How the roofs groan under the weight of drying corn; how the walls gleam and glory with the festoons of chili or red pepper! But in time the corn is dry, the peppers ripened enough for storage, and the work of "corn-sorting" begins. The different colors, yellow, blue, red, white, speckled and black are separated. 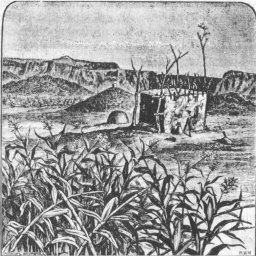 The "nubbin-ears" are put in a cellar by themselves for sale or for burros, and as described before, the corn is corded up in the granary around the tutelar divinities of the place--the "Father and Mother of corn crops." Patient reader, forgive me for having lingered so long in Zuñi cornfields. However closely we may have scrutinized these crops growing green, golden grown as they may have been, we have but barely glanced at them according to the rules and practices of their dusky owners. In illustration of his watchfulness--quite as well as in memory of a former promise--I repeat below a song of the growth of corn plants. Let me begin, however, by saying that shall give only in the first verse the prelude and refrain which opens and closes each stanza of the song. "Soil shorn and spread by storms! Soil shorn and spread by storms! There may now be seen, there may now be seen." Band of hunters, their corn grains sprouted. Band of hunters, their corn grains rooted. Band of hunters, their corn leaves fluted. Band of hunters, their corn leaves feathered. Band of hunters, their corn stalks tasseled. Band of hunters, their corn plants blooming. Band of hunters, their corn ears kerneled. Band of hunters, their corn ears silkened. Band of hunters, their corn plants sooted. Band of hunters, their corn grown aged. This song, although beautiful in the original language and music (possessed as it is of perfect metre, fair rhythm and considerable poetic sentiment) defies exact translation. Not only is it framed in archaic syllables, but the terms in Zuñi for every phenomenon connected with corn and its growth are so numerous and technical that it is as difficult to render them into English as it would be to translate into Zuñi the terminology of an exact science. I have, however, introduced this approximation as illustrative not only of Indian powers of observation but also as giving a fair example of the terms wherewith from planting time to harvesting time may be designated any given period; for the Zuñi, simply adding to any of the above expressions a syllable expressive of time, thus divides the quarters of the "Nameless Months."